The congenital heart surgeons at Wolfson Children’s have expertise in all congenital heart procedures, ranging from simple to highly complex. Whether it’s open-heart, minimally invasive or video-assisted surgery, our board-certified cardiothoracic surgeons use the most-advanced technology and techniques to repair heart defects. Our surgeons not only know how to operate, but they know which procedure is best for each individual’s situation and when it should be performed. The team uses advanced imaging techniques, including echocardiography, cardiac MRI and 3-D imaging, to help determine the right approach, resulting in some of the best pediatric heart surgery outcomes in the nation. The cardiovascular surgery team has expertise with machines that mechanically support the heart and improve blood flow to the body before, during and after many heart surgeries. Ventricular assist devices can take over heart and/or lung function long enough for the heart to heal, or until your child gets a transplant. All heart surgery patients recover in our specialized CVICU just for children and some adults with congenital heart disease who require close care and monitoring following catherization procedures and surgical repairs. Our 12-bed CVICU features advanced monitoring and treatment technologies, and is staffed by congenital cardiologists, cardiothoracic surgeons, critical care physicians, hospitalists and critical care nurses. 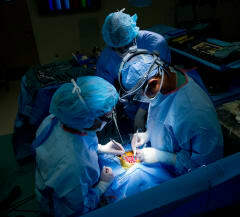 The real-time confirmation that repairs are working during the surgery also reduces the time a patient spends in the OR. Heart surgery patients at Wolfson Children’s Hospital receive special heart-shaped pillows upon admission. Not only are they cuddly and welcoming, but they’re therapeutic and educational as well. Doctors sometimes use the attached marker to draw on the heart diagram on the pillow, explaining the procedure to help put nervous children and parents at ease. After surgery, the pillow can be used to reduce pain by supporting the chest during movement, deep breathing therapy and coughing. Many families have their heart team sign their pillow before going home, which provides memories of the loving care they received. Cardiothoracic surgeons at Wolfson Children’s perform delicate heart surgeries and patients benefit from their collaboration and years of experience. Because Wolfson Children’s is a partner in the UPMC Children’s Hospital of Pittsburgh Heart Institute Network, children in our region have access to even more pediatric cardiac surgery resources and expertise. 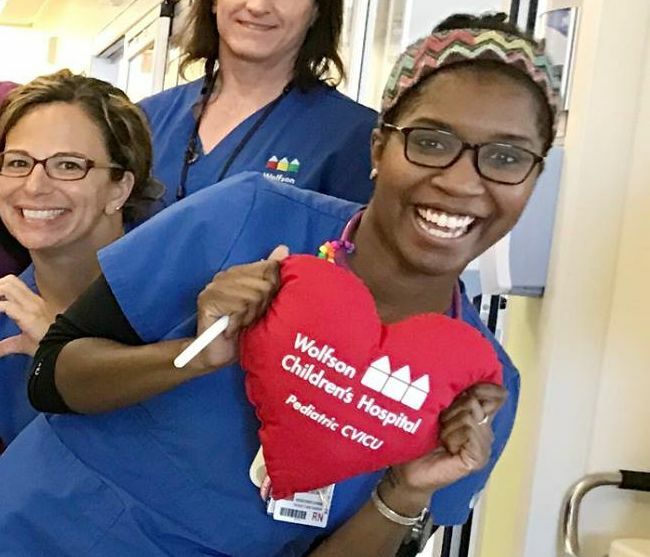 The heart surgery team at Wolfson Children’s also includes six pediatric cardiac anesthesiologists who have specialized training to ensure your child’s comfort and safety. Other important members of the surgery team are cardiac nurses, cardiac nurse practitioners, cardiopulmonary perfusionists who operate ventricular assist devices, and many others. After your child recovers from heart surgery and is sent home, follow-up care won’t be far from home. In addition to Wolfson Children’s Hospital in Jacksonville, we have satellite locations throughout North Florida and South Georgia. Read how Rebecca Zwass-Brown overcame multiple defects, surgeries and a groundbreaking procedure to fulfill her dream of motherhood.